According to a survey conducted by the Library and Information Statistics Unit at Loughborough University in the UK, between 1986 and 1997, the average annual price of journals printed on paper in that country has risen from £ 110 to £ 340 respectively, a rise of 308 per cent. With no foreseeable end in sight to the price rise and the increasing demand by students and trade professionals to read the latest journals, the cost to universities in purchasing journals from commercial publishers using the traditional paper format is becoming far too great. The problem is not restricted to the UK; it is a worldwide phenomenon. Consequently, some academics around the world are fighting back with the introduction of electronic journals on web sites (a kind of "digital library") costing a fraction of what commercial publishers are asking for their established print publications. Commercial publishers still pursuing paper format? "The downturn in the magazine industry has beaten back one of the giants of worldwide media. 'Two years after financing a magazine intended to test the viability of starting a magazine division, News Corp is getting out of the magazine business entirely. 'Advertising revenue across American magazines is down 8.2 per cent for June, compared with a year ago, according to the Publishers Information Bureau. 'Leading advertising categories like automotive, technology, media and advertising, finance, real estate, insurance and retail [all changeable information] are all down, compared woth a year ago. "Jonathan Weber, the Industry Standard's editor in chief, said the magazine was in crisis, but not dead. Perhaps the answer is sitting right under his e-nose! Or alternatively the publishers will have to greatly expand their subject range of paper-based publications and so increase the complexity of their business operations in the hope of maintaining their levels of profit. If publishers do decide to enter the online market in a big way, perhaps it might be possible for libraries to eventually become places of "hybrid" digital and non-digital information centres where only the very oldest, most stable, highest quality and culturally valuable books of a nation are kept/archived in the paper format and the rest is taken up with easy-to-use and highly compact computers (perhaps hidden away at the back of large colour LCD screens) attached to small desks running along large windows overlooking a park or something pleasant. In that way, people can comfortably access the very latest changeable information or view digital copies of various books stored at the library as soon as they become digitised. A good attempt at hiding the somewhat cumbersome and ugly-looking computer box inside something inconspicuous was made by Apple Computer, Inc on 7 January 2002 with the unveiling of the new intel iMacs. The iMacs reveal a totally new design comprising of a hemispherical (or dome-shaped) computer base with a 17-inch (1440 x 900 pixel) colour TFT/LCD screen attached to a large stainless steel "adjustable" arm on top of the base. The screen can be tilted up and down and swivelled through 180 degrees using this arm. 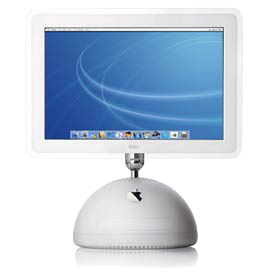 The iMac came with a 700MHz or 800MHz G4 microprocessor, 256KB L2 cache, a 100MHz system bus speed, and a NVIDIA GeForce 2MX graphic card with 32MB of Double Data Rate (DDR) over an AGP 2X port. This may sound like goobledygook to you, but all you need to know is that the iMacs will easily rip through a fair swipe of the most demanding software available on the market, including the big desktop publishing software like Adobe PageMaker, Photoshop, Illustrator, and QuarkXPress, and of course e-books/e-journals. Such a move would certainly help to alleviate the demands on librarians to re-shelve so many books returned by borrowers as well as finding enough space to store the more "changeable" variety of books and journals in the old paper format. Until publishers can get their act together, the only real use for digital information on the Internet is in tracking down previously difficult print or archival material (which tends to add considerably more solid, physical books and journals to a library). Digital information has not progressed far enough today to provide a comfortable and easy means of reading the actual printed text of books because not enough has been converted to the digital format, and the cost of quality digital monitors, software and computers are still just a bit beyond the budget of many small to medium-sized libraries. The revolution in having more e-journals has well and truly began. Today you can find just about every journal you want on the internet, including those from decades ago. The internet and computer technology has truly changed the way we find changeable information in journals forever. So, the question on everyone's mind will soon be: why do we need libraries and librarians? Have we reached the point where libraries are just a search engine, and librarians are the search fields where you enter a search criteria to find stuff? Is there anything we need librarians for? Patel, Kam. The borrowers' life on the shelf: The Times Higher. 4 December 1998.